Why not give dad a break this year and ask the professionals from TLC, Incorporated to take care of making sure your home or business in Maryland, Washington, DC, Northern Virginia or Delaware is one Santa and Rudolph just can’t resist! TLC has been providing professional landscape lighting and holiday lighting services for more than 25 years, and have brought the beauty and wonder of the holiday season to satisfied customers across a four-state area. But decorative lighting from TLC, Incorporated isn’t just for the holidays! TLC also designs and installs outdoor, decorative and security lighting for lawns, gardens, pools, hot tubs, decks, walkways – you name it and they’ll make it a feature that will add beauty (and value) to any home or business. 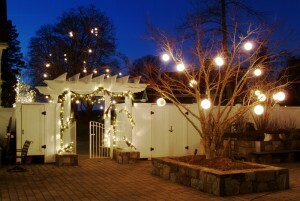 Contact us today and let the professionals at TLC ‘light up’ your next holiday season or special event.